The well-rested Runnin’ Rebels, coming off a bye weekend, certainly played hard for forty minutes in the 85-81 loss against the Lobos. Smart? That was a different story. With the Rebels trying to protect a 67-58 lead with 5:48 to go, 7-foot center Brandon McCoy, who had just missed two free throws, was whistled for a foul trying to defend 6-foot-5 freshman forward Makuach Maluach, then compounded the mistake by slamming the ball to the floor for a technical. New Mexico sank all four ensuing free throws to cut the lead to 67-62. 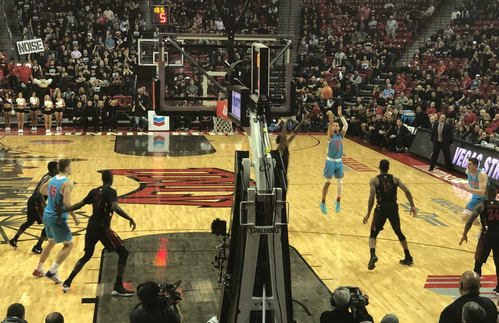 Still, the Runnin’ Rebels (13-5, 2-3 MW) looked in good shape when point guard Jordan Johnson answered with UNLV’s first 3-pointer of the night – everyone can exhale – to make it 70-62. But trying to protect a five-point lead with only 1:07 remaining, Jovan Mooring inexcusably fouled Anthony Mathis on a long 3-pointer from in front of Gucci Row which banked in. Mathis then sank the free throw for a four-point play, and New Mexico trailed, 81-80. Mooring missed a 3-pointer on the ensuing possession and Mathis got the rebound to set up what proved to be the game-winning shot, another 3-pointer by an open Mathis as Mooring was late to cover coming off a double-team. (See video below) Menzies said afterward Mooring wasn’t supposed to double on the play, leaving one of the league’s top 3-point shooters open. Johnson then rushed the ball back up the court and but couldn’t finish on his drive to the basket. Joe Furstinger got the rebound, was fouled with 3.1 seconds left and then sank a pair of free throws to clinch the first road win in eight tries this season for New Mexico (9-11, 4-3). UNLV: With McCoy playing just 19 minutes because of foul problems, 6-foot-11 freshman forward Cheikh Mbacke Diong came off the bench to score a career-high nine points on 4-of-4 shooting, grabbed six rebounds, blocked four shots and altered several others. New Mexico: Mathis, who entered the contest shooting 46.2 percent (49-of-106) from 3-point range which ranks third in the Mountain West, scored seven of his 14 points in the final 67 seconds, including the game-winning 3-pointer. “I thought we played harder than most games but we didn’t play smart.” – UNLV coach Marvin Menzies. UP NEXT: The Runnin’ Rebels begin a two-game road trip on Saturday afternoon at Colorado State (10-10, 3-4), a 76-71 loser at home on Wednesday night to Air Force. The 2 p.m. contest will be televised on CBS Sports Network. UNLV then plays at Fresno State on Tuesday night before returning home to host San Diego State on Jan. 27.
NOTABLE: Johnson’s 3-pointer with 5:37 remaining extended UNLV’s beloved streak of sinking at least one 3-pointer to 1,024 consecutive games. … The Runnin’ Rebels finished with a 54-34 edge in points in the paint and an 18-2 advantage in fast break points. … UNLV finished just 19-of-30 at the free throw line (63.3 percent) while New Mexico was 19-of-22 (86.4). … Rebel F Shakur Juiston finished with 14 points and a game-high 14 rebounds for his eighth double-double of the season. … The Lobos, who entered the game leading the Mountain West and ranked 15th nationally with an average of 10.8 3-pointers made per game, finished 10-of-26 behind the arc (38.5 percent) while UNLV finished 2-of-13 (15.4). … Counting its Mountain West Tourney overtime loss to San Diego State, UNLV is 1-8 in its last nine conference home games at the Thomas & Mack. Click on graphics below for final stats and Mountain West standings.